This summer should be big for all the major TV brands that are going to release the new wave of 3D-capable HDTVs, or at least everyone hopes it to be like that and expects this to happen, but will it turn out as expected or not is another thing. It very much depends on how many early adopters will go for the 3D technology on a TV for more general use and not just for specifics like gaming in stereoscopic 3D which is something that you can even do at the moment with a 120Hz monitor. A 3D-capable HDTV will bring you a bigger screen which is best suitable for movies, but you’ll be getting the whole thing – 3D photos, movies and games. If you’ve been watching closely nobody besides Sony is talking about stereo 3D gaming, but Sony is doing this related to their PlayStation 3 console only, but what about the PC users? I mean at the moment playing games in stereoscopic 3D is the best thing you can do on a 3D-capable display and this is just because there is enough content. Basically almost all 3D games can easily be played in stereo 3D with the help of special software such as Nvidia’s 3D Vision, DDD’s Tridef Ingnition or iZ3D’s Driver and you don’t need games that are specially made for S3D, although that does help. Unfortunately there is no information regarding how and if we are going to be able to use these new 3D-capable HDTVs along with out computers to play games in stereo 3D or watch 3D movies! And considering that at the moment S3D gaming is the major driving force for the adoption of 3D-capable monitors why it seems that the TV manufacturers tend to completely ignore the most important factor? Sky Channel 3D appears to be the first of the 3D TV channels that we are expecting to see, but this one goes on air in United Kingdom only, sometime in April. And they already did some interesting tests by broadcasting a football match between Arsenal and Manchester United in a few different pubs in London, Manchester, Cardiff and Edinburgh. And this test received quite good feedback from the people that were lucky to be actually watching the game in 3D. Have in mind that the April launch seems to be only related to having the 3D sports content being pushed to a wider number of pubs and not to the general public. And later in the year, Sky 3D will be made available to all Sky+HD customers with a range of content on offer, that will include movies, sport, documentaries and entertainment programs. DIRECTV (names unknown), backed up by Panasonic should be starting up 3 dedicated 3D channels in the USA. They should be available beginning in June 2010, with customers of the DIRECT TV HD service getting a free software upgrade enabling them to have access to the new 3D channels through their 3D-ready television sets. DIRECTV’s new 3D channels will deliver movies, sports and entertainment content. Also DIRECTV is currently working with AEG/AEG Digital Media, CBS, Fox Sports/FSN, Golden Boy Promotions, HDNet, MTV, NBC Universal and Turner Broadcasting System to develop additional 3D programming that will debut in 2010-2011. At launch, the new DIRECTV HD 3D programming platform will offer a 24/7 3D pay per view channel focused on movies, documentaries and other programming, a 24/7 3D DIRECTV on Demand channel and a free 3D sampler demo channel featuring event programming such as sports, music and other content. ESPN 3D is another channel that will be offering sports programs starting this summer (in USA), beginning June 11 with the first 2010 FIFA World Cup match South Africa vs. Mexico. The network plans to feature at least 85 live sporting events during its first year, but they’ll probably have other non-live sports content to fill in the holes, but the channel will most likely not be airing content 24/7 at first. Among the planned sports events to be aired live in 3D are up to 25 World Cup matches, the 2011 BCS National Championship Game, college basketball and football and the Summer X Games. Canal+ 3D will be the first 3D TV channel in France with a launch date planned before Christmas 2010. The new 3D channel will broadcast movies, live events, sports and animation. With the current set-top boxes available to satellite subscribers of Canal+ said to be already compatible with the upcoming 3D broadcast, the only thing that remains is for the viewers to get a hold of a 3D-ready TV set. 3D Pictures is set to launch its own 3D TV channel by the end of this year in Spain. The new channel should be made available to the users via IPTV, satellite, cable, different mobile devices and so on. The channel is currently negotiating with suppliers of content such as sports, movies, concerts, entertainment, documentaries, animation, plays, circus, current affairs and high profile live events. Discovery 3D (most likely name) by Discovery Communications, partnering with Sony and IMAX is another 3D TV channel competitor expected to launch in 2011 (in USA), but with plans to have content 24/7, unlike some early competitors. The program of the channel will feature high-quality premium content from genres that are most appealing in 3D, including natural history, space, exploration, adventure, engineering, science and technology, motion pictures and children’s programming from Discovery, Sony Pictures Entertainment, IMAX and other third-party providers. But what happens if you don’t happen to live in USA, UK, Spain, France or Korea for that matter as they seem to be always ahead in terms of new technology – no 3D TV for you at least for now. Of course the major TV networks will soon have their 3D channels available in other countries too with localized subtitles, but that might bring other issues as 2D subtitles will not always look good over all 3D video content. And even then, there is the matter with you having to wear glasses every time you want to watch TV and that is also something that will take some time to getting used to for most of the people that are new to 3D. So in the end there are a lot of unknown factors yet ahead of the wider stereoscopic 3D adoption that everyone is betting on for starting the summer of this year. What to Choose: IMAX 3D versus RealD versus Dolby 3D for 3D Movies? This is a bit newer standard, but a digital one from its start… digital here meaning that the movies are recorded in a digital format and the projectors being used are also digital. RealD 3D cinemas uses circular polarized plastic glasses instead of linear polarized to provide better user experience when watching stereoscopic content. Circular polarization is considered to be better, because viewers are able to move their head as they like without the loss of the 3D depth effect. With the linear polarized glasses you have to be a bit steady, not moving around too much and sometimes you might have trouble finding the right position for your head in order to achieve the best effect when watching the movie to fully enjoy it. 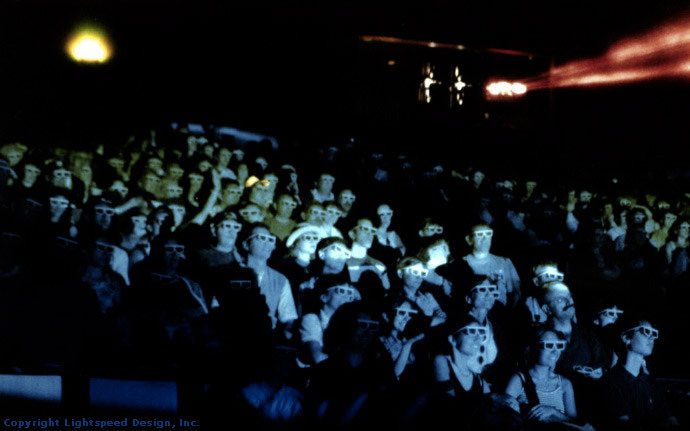 The circular polarized plastic glasses used here are also cheap to produce, but this technology requires the use of more expensive silver screen for projection which makes it a bit more expensive to implement. Still at the moment RealD is the most widely used standard for stereoscopic 3D movie projections all over the world, so you will most likely have one of these cinemas where you live. The immersion experience with RealD is a bit different compared to what you get at IMAX 3D projections as here the depth perception is of actual depth so the action is more going inside the screen, and not popping out of it. This does not make things less impressive, although some people might get a little disappointed at first if they were expecting to have the IMAX 3D pop-out effects, but after some time of watching they still get the feeling they are right in the middle of the action. This way of going more in the projection screen and not out of it is also easier on your brain as it is not that overloaded with information and is considered better for longer movies. Also it is easier to keep track of quick action scenes and the ghosting is usually less, so most of the people prefer this technology, although it is still not perfect. Also known as Dolby 3D Digital Cinema is the newest of the three technologies for stereoscopic 3D movie projection and as you can guess not only by the name it is as well digital like RealD. A lot of people find that Dolby 3D is the best stereoscopic 3D technology for them to watch movies in the cinema. Here we also have the typical cinema style plastic 3D glasses that use a bit more specific passive filters related to the main colors we see which is by far considered to provide the best results. Of course this special type of polarization brings the cost of the glasses up compared to the normal linear or circular polarized glasses the other technologies use, but there the projection screen doesn’t have to be specific (Dolby 3D at home, anyone?). Dolby 3D provides better color reproduction (colors look a bit brighter and more vivid) and a sharper image with more details visible (especially in darker areas), better contrast and almost no ghosting of the objects you see on the screen, which also are not that much popping out of the screen like in IMAX 3D, but rely more on inside depth, like with RealD. Still the stereoscopic 3D experience here is yet again not perfect as you might have trouble with the quick refocusing of your eyes on some objects moving fast from the back to front and some people might have weird troubles seeing the right colors some rare occasions. Here is something interesting for all of the Avatar movie fans out there. IMAX is organizing a 24 HOUR Avatar IMAX 3D Fan-a-thon for the official launch of the movie. 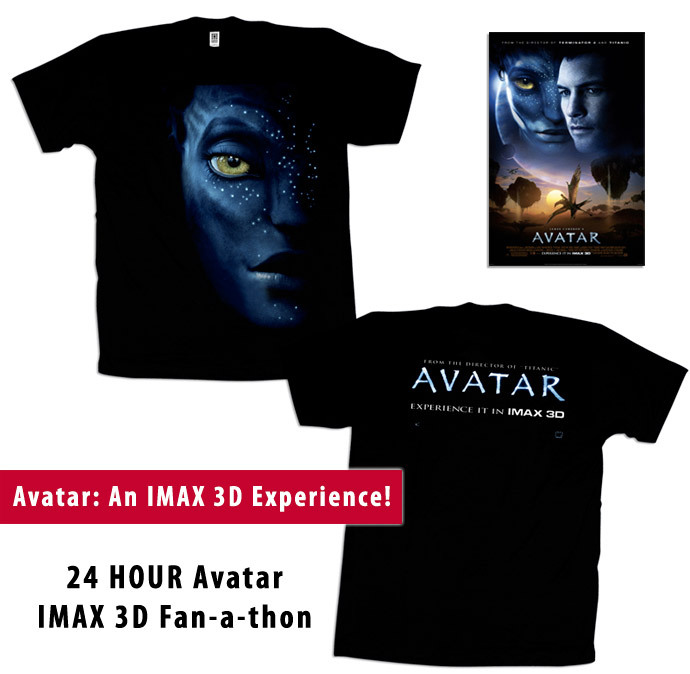 IMAX will be giving away Avatar: An IMAX 3D Experience posters and Avatar themed t-shirts along with other Avatar prizes every hour throughout the day and there will be over 50 winners. The Fan-a-thon starts on December 18 at 12:01 AM EST and will run for 24 hours so don’t miss your chance.